Inspirafashion: Peach and mint florals. Light blue vintage Levis denim vest via Sifted Vintage, Pastel pink/mint Forever 21 floral dress, Ivory vintage Chanel purse, Ivory c/o Beginning Boutique bold ruler ring, Bracelets: F21, Coach, CC Skye, Brown Urban Outfitters wedges. I am embracing all pastel colors I can get my hands on for this Spring. Colors I adore are sorbet/cotton candy shades, like mint, peach, lilac, sky blue, and soft yellow. Anything from Louis Vuitton's S/S '12 collection has me excited for pastels this Spring. I know cliche to wear pastels for spring season..and even in a floral pattern, but couldn't help myself. I was so drawn to this dress when I spotted it at Forever 21. I think something that will always be signature to my style is my love for mixing edgy and sweet pieces together (creating a great irony) -- ie. this floral dress paired with this amazing vintage Levis denim vest from Sifted Vintage (which I scored as well at the Alameda Point Antiques Faire). And a sweet Spring outfit wouldn't be complete without a pair of sandals, but better yet for comfort: sandal wedges from UO. I know everyone said the groundhog Phil saw his shadow this year, but the sun nonetheless came out this past weekend! I hope the beautiful sun is here to stay. Have an amazing week ahead Beautifuls! Happy Monday! Kathleen that dress is absolutely stunning! You always look so dang pretty! Be sure to enter the giveaway I'm hosting on my blog<3 I'd love to see you win!! that dress is the cutest! 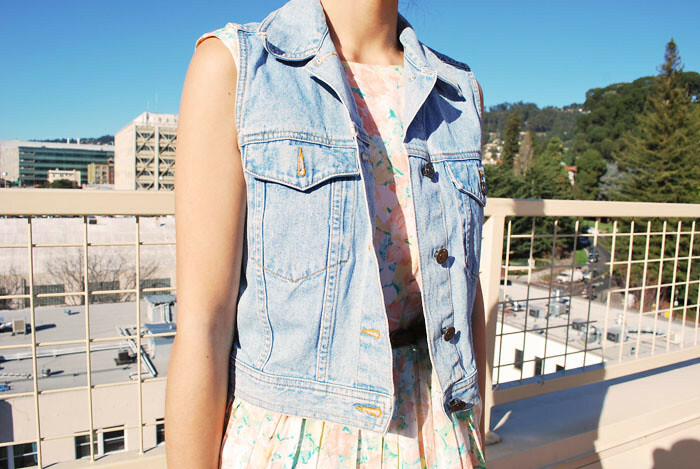 love the colors on you, and how you paired it with the denim vest! those wedges are cute, too! After looking at you now I'm missing spring desperately! Florals and denim make such a sweet combination! Love the Chanel clutch! love ur clutch!!! and lovely dress! Kathleen, you're making me wish for spring and warm weather! Darling outfit! Love your outfit!! Your vintage chanel bag is to die for! this is so summery! love the denim waistcoat! I love your dress! Hopefully in another month or two it will be warm enough for me to wear one too!! A beautiful color combination with those neutral shoes and clutch. Love how subtle the whole look is! super duper Love!! the sunshine is so refreshing! you look so darling, my dear friend <3 hope that this week is treating you well! thanks so much! these dress is totally adorable! LOVE the colours, the shape, and the pattern! amazing! Visit mine, and if you want we can follow each other! Love the colors on that fantastic F21 dress. This is a really really great outfit, Kathleen. Props. I love EVERYTHING about this picture! I've been looking for a jean vest/jacket that looks similar. You look stunning dear! I just found your blog and I love it! I´m your new follower!